SAW Saw's long spin up time early game makes it easy to bully him out of the lane. Maximize your Fan the Flames once he is fully spun up. If you play against him right, you should have killed him twice by 5:00. Joule Joule's easily dodgeable stun and skillshot Thunder Strike make it easy to maneuver into position for a Spitfire. Follow up quickly with auto attacks to maximize Fan the Flames. Adagio Adagio's slow makes him dangerous once the game progresses past 5:00 and the lane opens up to ganks from the jungle. His heal doesn't out-regenerate the Fan the Flames perk, however, so if you get the chance to land your Spitfire on him press the advantage. Petal Petal can almost equal Skaarf's range on Spitfire, and her Munions make it incredibly hard to land the skillshot. Recommend throwing Goop behind her Munions and then following up with Spitfire to give yourself the advantage. Ardan Ardan's perk, Julia's Gift, makes him incredibly hard to kill by burn. His heal almost matches the burn's damage, however he doesn't output a ton of damage in return. His biggest threat is the Gauntlet. Avoid it. Catherine Catherine's stun and shield make pressing an advantage against her more difficult. Whenever you're up against her, let allies move in first and attack from a distance. Glaive Glaive's main threat is his Afterburn, which can launch you into a tactically fatal position in a flash. Stay out of range of Afterburn and you'll be alright, though. Koshka Koshka's burst damage is very effective, and her rapid escape allows her to dive you at half to quarter health under a turret. Her stun also interrupts Dragon Breath, so be wary of using it whenever it's up. Vox Vox's OP Crystal abilities right now make him one of the highest threats to Skaarf in the current meta. When you're playing against a Vox, stay away from his ult and don't mess with him in teamfights. Ringo Ringo is singlehandedly Skaarf's greatest weakness. His range outplays Skaarf's and he can whittle your HP down very quickly. Recommend playing very defensively and letting your jungle or tank initiate first. Taka Taka can down Skaarf in 3 hits at level 6, and that trend continues for the rest of the game if you aren't careful. If you play against a Taka, use goop and flares to give you the advantage, but still remain very wary. Krul Krul's natural lifesteal makes him incredibly hard to kill. Very rarely should you engage a Krul 1v1 as Skaarf. If you do, kite him and throw your Spitfire to maximize the burn from Fan the Flames. Your range is your advantage. Please read carefully below, there are some key changes. I've highlighted them in the change-log at the end. As of writing this, this Skaarf build has singlehandedly carried me through solo queue to Pinnacle of Awesome on a streak of 21-2. 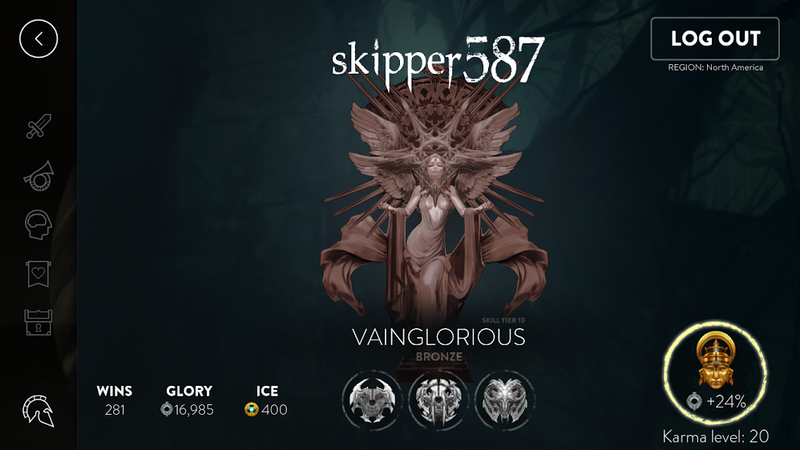 From there I team queued to Vainglorious. It is not like every other build you will read on this site, so read on to see how I did it. Skaarf is a fun little fireball and one of the least understood Heroes in Vainglory, and because of this he is a huge threat for those who know how to play him right. There are two builds I use: Vampire Skaarf and Inferno Skaarf. Use the first against early peak team comps, use the second against late peak team comps. Before we tackle the methods you're going to need to use to win as Skaarf, first let's talk about his abilities. Skaarf's abilities burn targets and his basic attacks deal bonus crystal damage to burning targets. Deals reduced damage to Kraken and structures. This is easily Skaarf's most overlooked ability, and it's also what makes him the most dangerous. As a dragon, it's natural that all of Skaarf's abilities have the potential to set his enemies on fire. That's what dragons do, right? But not only do Skaarf's abilities set his opponents on fire, but his basic attack increases the burn damage by 2% of the opponent's maximum health every time it hits (up to a whopping 8% a second), as well as refreshes the burn duration. Hitting opponents with other abilities also refreshes the burn duration. Even after his nerf, this still makes Skaarf an enormous threat early game. Skaarf spits a fireball that collides with the first hero, structure or boss monster it hits. The fireball damages & passes through smaller minions. Each time it passes through a unit, its damage is reduced to 85% of before. Deals 50% less damage damage to minions. Skaarf's A-slot ability is a skillshot. It's got a range that exceeds almost every other ability in the game, but it's blocked by turret, minions, Munions, Petal Flowers, and Jungle Creeps. The quick refresh time makes it a good harass in the lane, but be careful as you position yourself to take the shot. Moving too far out of the center of the lane opens you up to ganks early on. Late game Spitfire also serves as a good bush check, rather than face-checking. Skaarf hurls a goop onto the target location. Enemies walking through the sticky substance are slowed. Any of Skaarf's flames will ignite the puddle, dealing burst damage and burning enemies over time. Deals half damage to minions & Kraken. Skaarf's B-slot ability is a great zoning ability. Skaarf fires a pool of black sludge at a target location, slowing enemies who move through its radius. As a second perk, all of Skaarf's other abilities and enemies who are already on fire will ignite Goop for bonus damage. Enemies who are not on fire who move through Goop will be set on fire. Goop is useful in tactical retreats for slowing enemy pursuit, helpful in teamfights for slowing enemy retreat, and deadly in 1v1 or 1v2 confrontations in the lane early game. Use it tactically. Skaarf's C-slot ultimate ability is a massive momentum changer. On trigger, Skaarf inhales deeply, accelerating all closing teammates and slowing all fleeing enemies in a large cone in front of him. When he has finished inhaling, he releases a massive burst of fire in a large cone in front of him, slowing closing enemies, accelerating all advancing teammates, and setting everything in his path on fire. Most enemies will turn the opposite direction when they see Skaarf's ult charging, but it is interrupt-able by Krul, Koshka, and Catherine, so be wary in how and where you charge it. It's also worth noting that with Skaarf's late game buff, this ability receives a natural shield pierce, 15% per ability point. No more weak Dragon Breath! It's also important to note that while I formerly recommended that you not max this ability, I now recommend that you do, and short-change Spitfire. 45% shield pierce is not something to overlook. If you're playing Vampire Skaarf, you're still going to want to press the early game advantage. Skaarf's level 1 is unparalleled in the game right now, and it's worth making use of it. The difference comes in how you play. Vampire Skaarf has a later peak than Inferno Skaarf, so you have to hold out until you've gotten both of your Eve of Harvest built before you really begin to shine. Fend off jungle invades, but don't over-extend. Continue to bully your opponent in the lane to give yourself some breathing room on your build, but don't miss farming. Activate: Sprint for 1.5 seconds (150s cooldown). Note: Boots do not stack. Between picking up early kills and proper farming in the lane, a good Skaarf will be able to touch into Tier 2 items by 5:00. Ganking phase typically begins around the 5-6:00 mark. At this point it's essential to start playing cautiously around the bushes on the bottom of the lane. Skaarf is still squishy at this point, so he's vulnerable to burst attacks from Krul, Koshka, and Taka. If you're unaware of enemy positioning, I recommend playing towards the top of the lane. Remember to keep an eye on the jungle and support your junglers where you can. By the time the Ganking Phase degrades into all out teamfighting, you should have both of your Eve of Harvests and your Piercing Shard. As needed, also buy a Reflex Block. I recommend buying infusions from 15:00 to 25:00, as they'll do you more in the long run. Maximize infusions by consuming them right before you unleash your Ultimate. Eve of Harvest helps you with sustainability and will keep you alive much longer in this phase than normal. The Piercing Shard adds another 15% shield pierce to Fan the Flames and Dragon Breath. This is where Skaarf begins to get ridiculous. The teamfighting phase is best played from behind the safety of your allies. Skaarf rarely initiates a fight, unless he's using Dragon Breath to give his team momentum. During the teamfighting phase, Skaarf's primary targets should be high-dps, high mobility heroes like Taka, Koshka, and Glaive, or support heroes like Adagio and Ardan. Be wary of targeting Catherine or Krul, as they'll soak your damage while their teammates position themselves, and stay away from Petal and a fully spun up SAW like your life depended on it. Also take the opportunity to clear large minion waves for the gold bonus. You're going to be spending a lot of gold in this phase, so using every lull in the battle to farm is recommended, but don't do so at the expense of your teammates. By the 20-25:00 mark, you should have fully completed your Shatterglass and Broken Myth. The lifesteal from your double Eve of Harvest allows you to hold your own in a 1v1 or 1v2 fight long enough for help to arrive. And the Broken Myth is your first step into the final section of your build, and gives you enough damage to be a considerable threat in teamfights. Focus on maximizing the placement of Goop + Spitfire and keeping Fan the Flames running. As soon as the match begins, pick up an Energy Battery and Halcyon Potionx2 from the shop and move into the jungle. You're going to want to take advantage of Skaarf's level 1, so I recommend invading. Support your jungle during the early teamfight. If you're playing Skaarf right, you should have at least one kill when all is said and done. When the invade is over, move into the lane and begin farming. Focus on last hitting with your basic attack and using Spitfire to harass the enemy lane. Spitfire + 1 basic attack are enough to keep your opponent off of farm for quite a bit. If you're feeling particularly aggressive, push the advantage and go ahead and finish off your opposing laner. It will set you ahead for mid-game, which is Skaarf's weakest point. Inferno Skaarf should average a kill a minute until 6-8 minutes if you're playing him properly. Invade heavily, deny your opponents farm. Assert your dominance as the Skaarfungandr. By 9:00 you're going to want to have your Shatterglass finished. This will help you stay ahead in the pressure game. If you're playing Inferno Skaarf, you're less likely to have to worry about ganks, but that doesn't mean play carelessly. Watch the bushes, keep Flares on you. The enemy jungle might get desperate and 3-man you out of spite. Watch your jungle rotation during this phase and invade when proper. By the time the Ganking Phase degrades into all out teamfighting, you should have a Shatterglass and Piercing Shard. As needed, also buy a Reflex Block. I recommend buying infusions from 15:00 to 25:00, as they'll do you more in the long run. Maximize infusions by consuming them right before you unleash your Ultimate. The Shatterglass increases your damage and the Piercing Shard adds another 10% shield pierce to Fan the Flames and Dragon Breath. Inferno Skaarf plays differently in teamfights than Vampire Skaarf, as you use Spitfire more than Goop or your ultimate in these fights to deal damage and wear down a team. Use Goop to slow advancing/fleeing enemies, but don't set it on fire straight away. Mop up what's left with Dragon Breath when you're in the clear. By the 20-25:00 mark, you should have fully completed your Eve of Harvest and Broken Myth. The lifesteal from your Eve of Harvest allows you to hold your own in longer fights, and the Broken Myth is your direct counter for enemy defense. If the game progresses past 25:00, then it's time to start playing reactively. Most enemy heroes have reacted and built up defensive items to counter your damage by this point, so fight under turrets or in confident 3v3 situations. Don't venture the jungle alone, a gank will drop you almost instantly. The most important thing you can do in the post-20:00 phase is pick off enemies while you finish your build and react to the enemy build. The best bet is to build a second Shatterglass. Skaarf deals so much damage, a Shatterglass just increases that further. If you'd rather have your abilities on shorter cooldown, you can consider building a Clockwork as well. And remember, Crystal Infusions are really nice to have on your hotbar for teamfights. If you've got the opportunity to pick your teammates, a team with Catherine on it is highly recommended. Her stun coupled with her massive late game tankiness makes her a valuable ally in teamfights that otherwise would get aimed straight at you. Let her initiate fights and soak damage while you burn things from afar. Since you're sacrificing damage mid/late-game for survivability and sustainability, at least one high DPS hero is recommended as a teammate. Taka's burst damage is rivaled only by Ringo, but his threat is infinitely higher due to his ability to appear from the shadows and return to them just as quickly. Krul is a deadly abnormality that you can capitalize on as Skaarf. His lifesteal makes him tanky, especially if built right, but he puts out vulgar amounts of burst damage with Spectral Smite. This combination makes him valuable in teamfights where enemies focus on you or your true tank first. If you're going two-up in the lane, then Ringo's highly recommended. His damage output coupled with his slow keep enemies either at bay or in range of your auto-attack. Just make sure that you support your jungler well or you risk having an under-powered jungler late-game. Ardan's ult Gauntlet is singlehandedly the best ult you can pair Dragon Breath with. There's no escape from a lot of damage if you blaze through the Gauntlet with Dragon Breath while your enemies are trapped inside. His damage shield also protects you during teamfights. 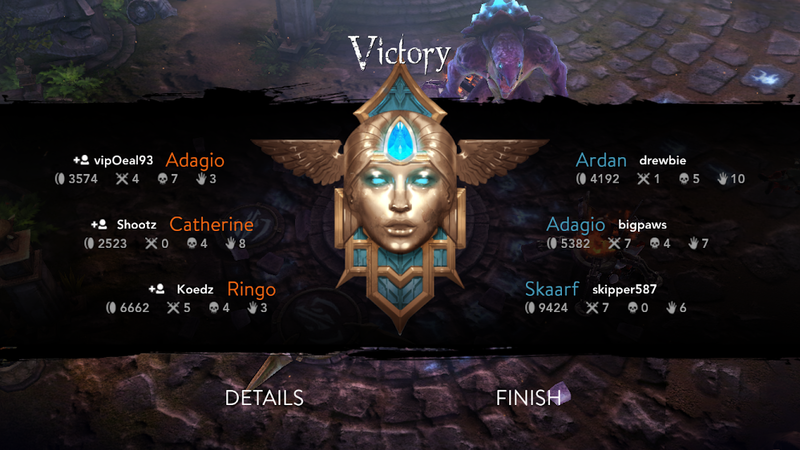 Ardan is a valuable ally. Taka's mobility makes it easy for him to inflict huge amounts of damage to you, disappear and get out of range, and come right back to finish you off. Whenever you play against a Taka, keep flares in your inventory around level 6 or risk being set back by a quick pick-off kill in the lane. Krul's natural lifesteal makes him incredibly hard to kill. It out-heals your burn in almost all cases. Very rarely should you engage a Krul 1v1 as Skaarf. If you do, kite him and throw your Spitfire to maximize the burn from Fan the Flames. Your range is your advantage, but he can close the gap quickly. Koshka's burst damage is very effective, and her rapid escape allows her to dive you at half to quarter health under a turret. Her stun also interrupts Dragon Breath, so be wary of using it whenever it's up. Vox is a strong hero. Period. If you're going to stay on top of him you've got to threaten him, otherwise he's going to be a royal pain in the tail late-game. It's important to note that some things change at higher tiers. As I'm finding out in my journey through the last two tiers in the game, people start to counter Skaarf very effectively at high-ELO gameplay. When the going gets tough, the tough adapt, and that's exactly what you're going to have to do. I've outlined a few crucial things that you need to watch for in high-tier queue. Though it's not long enough to protect them from all of it, a Crucible can mitigate a size-able portion of your ult's damage. Let teammates bait the Crucible before you begin your windup on Dragon Breath. In cases where teams build multiple, play extremely carefully. The slightest miss-timed windup will seal your doom. They're also quite useful if a teammate has one. The same principle applies to CC abilities, like Catherine's Merciless Pursuit or Glaive's Afterburn. Bait them into using these abilities, then begin your entry so that you don't get knocked out of a fight early. It's also worth noting that Catherine's Blast Tremor is incredibly useful in conjunction with Skaarf's ult. When hit with her silence, enemies are unable to cast Aegis, Crucible, or Reflex Block, as well as their own abilities. That makes them ripe for the picking. As for coordinating those ultimates in solo-queue, I'm writing a guide on communication meta that you will be able to find on VainShame.com shortly. In top tier gameplay, bushes are your fourth worst enemy in the Fold, besides that Krul on your team who doesn't know what he's doing. If you don't have visibility in them, they're a threat and you should avoid them like they're going to steal your little dragon soul. If you have even one enemy who you don't know where they are, I advise caution. I mained Koshka for a while, but the more I've played Skaarf, the more I've come to enjoy the little dragon. When played right, he can control the swing of the game right out of the gate. Plus it's just darn fun to set things on fire! I've outlined almost all of the most important tricks to playing Skaarf in this guide, but that's not to say that this is all of them. There are other little tricks that I'll keep to myself for the sake of having the upper hand if we meet, but if you follow the steps that I've laid out then your Skaarf will improve dramatically and you'll be hard pressed to be defeated. Remember, the keys to Skaarf are to play defensively and never put yourself in positions where you can be targeted quickly. Fight from behind minions, near turrets, or behind allies. And always fan the flames! Below are guides from the community that I recommend that you check out! Written by an engineer and Georgia Tech grad, this guide is a comprehensive and very close to exhaustive resource for everyone wondering how to maximize your build's effectiveness. I personally used the information gathered by Badger in my own guide. Powerhouse Celeste ~ Dat Ult! "Another mage guide? Really Skipper?" You bet your fine self. Mages are love. Mages are life. Read this if you want to learn how to use Celeste's ult to ruin someone's day. Changed: Guide flow to match new build. Removed: Petal as a threat in the "dangerous enemies" section. Added: Vox as a threat in the "dangerous enemies" section. Added: High tier strategy section. Removed: A section where I was still referencing the defensive items I no longer build. Changed: Most of the strategy to be in line with my new carry strategy. Added: Aftershock and build path. Removed: Hourglass and Alternating Current build path. Added: Piercing Shard and build path.